Bill Deering came to the University of Miami from Michigan. He was an outstanding track star setting the State record in the pole vault of 16' 2" in 1989. He continued his outstanding career at the University of Miami where he was a three time Big East Indoor Champion and two time Big East Outdoor Champion (1992-1994). He won All-American Honors in 1992 and 1994. He is the present record holder for the University of Miami for both indoor and outdoor pole vault. Bill was team captain of the University of Miami Track and Field team his senior year, 1994. In 1992 he was an Olympic Trials Finalist with a jump of 18' 2." 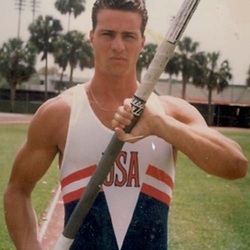 In 1994 he was the NCAA Outdoor National silver medalist; in 1995 he was a silver medalist in the Pan Am games, competing on the United States Team. Bill currently resides in Niles, Michigan teaching and coaching track and field.